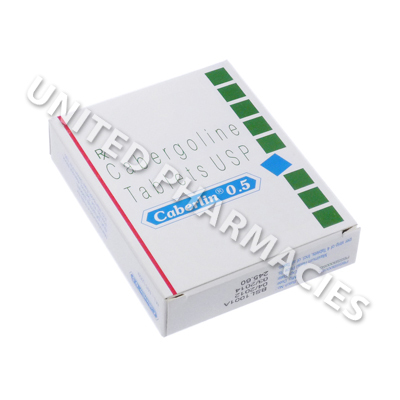 Caberlin (Cabergoline) is a type of dopamine receptor agonist which is commonly prescribed to treat medical disorders occurring as a result of high levels of a hormone called prolactin (this condition is widely known as hyperprolactinemia). Women affected by high prolactin levels may notice symptoms such as excessive or unnecessary production of breast milk, missed periods or difficulty becoming pregnant. Men with high prolactin levels may experience an enlargement of the breasts and a decrease in sexual ability. In some cases, this drug may be used to treat prolactinomas (a type of benign tumour in the pituary gland). By decreasing prolactin production, this drug treats all of the conditions listed above. Before taking Caberlin (Cabergoline) tablets, a medical consultation will be necessary, to allow your doctor to prescribe the correct dosage for you. Adults treating hyperprolactinemia may be prescribed an initial dose of 0.25mg taken by mouth, twice per week. The prescribing doctor may decide to increase this by 0.25mg taken twice a week. The maximum dosage is usually 1mg taken twice per week. It is important for patients to note that the dosage prescribed can depend on the patient`s serum prolactin levels, and for this reason, it is very important to follow the prescribing doctor`s instructions. You should inform your doctor about any side effects which occur. Serious reactions are possible, and immediate medical attention is required should this happen. Examples include unusual changes in vision, pain in the groin, lumps noticeable around the stomach, reduced urination and coughing. This list is complete, and it is possible that some reactions which have not been listed here may occur. Although it is not common, in some cases, patients who have taken this drug have developed a fibrotic reaction (thickening of the lining which covers the internal organs). An X-ray, as well as blood tests and an echocardiogram may be necessary prior to the commencement of treatment, and during treatment, so as to check for this condition. Regular gynaecological tests may be required by women taking this drug. 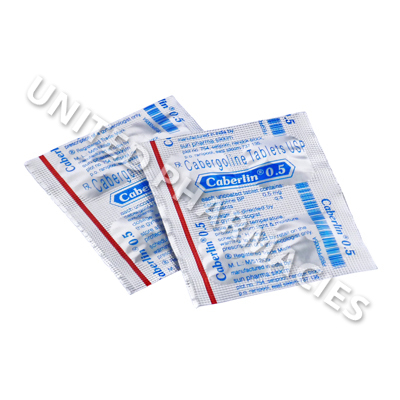 Always use Caberlin (Cabergoline) as you have been prescribed by your doctor. Never self-medicate or change your dosage without first consulting your doctor. The correct dosage can vary depending on your health, medical history, and the severity of the condition being treated.